It seems like only yesterday that Nicklas Backstrom was a 19-year old rookie lacing up his skates to face the Atlanta Thrashers in his first NHL game, but when he laced up his skates to face the Pittsburgh Penguins to open the 2016-2017 season he was embarking on his tenth NHL season, becoming just the 16th player in team history to play ten or more seasons for the Washington Capitals. By the time the regular season was over, Backstrom stood in ninth place in games played for the franchise (734). In some ways, the 2016-2017 season was among his best. His 23 goals was the second-highest total of his career, topped only by the 33 he posted in 2009-2010. He had 63 assists, the third-highest total of his career and most since the 2009-2010 season. Backstrom finished with 86 points, the second-highest total of his career (101 in 2009-2010). 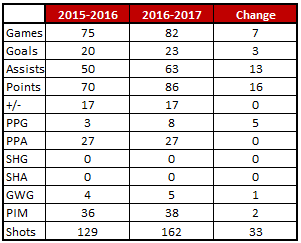 Backstrom, who has been a model of consistency over his career, assembled his 2016-2017 season in what amounted to two distinct parts. He started his season in good, but unspectacular fashion, going 10-24-34, plus-8 over his first 40 games. But, starting with a four-point game against Pittsburgh in his 41st game of the season, he raised is production, a case of kicking his playmaking into high gear. He had 13 goals over those last 42 games, but he recorded 39 assists. The 52 points Backstrom recorded over those 42 games starting with that four-point game on January 11th tied Connor McDavid for most in the league over that span to close the season, and his 39 assists led the league outright. He also led the league in power play points over that period with 21. The odd part about Backstrom’s year in possession numbers was the extent he dragged down, or perhaps was dragged down, by his most frequent linemates, Alex Ovechkin and T.J. Oshie, at 5-on-5. As a group, that trio had a 50.25 Corsi-for at 5-on-5, ninth-best of 13 forward combinations skating at least 50 5-on-5 minutes together this season for the Caps (numbers from Corsica.hockey). Breaking that down, Backstrom had better individual numbers when apart from either Ovechkin or Oshie, and conversely, Ovechkin and Oshie had better numbers when apart from Backstrom (numbers from stats.hockeyanalysis.com). Fearless’ Take… How many players in the league have more 50-assist seasons than Nicklas Backstrom since he came into the league in 2007-2008? If you answered “none,” you win a prize. This was his seventh such season in his ten-year career, tying him with Ryan Getzlaf for the most 50-assist seasons in the last ten years. Topping 60 assists this season, he also tied Henrik Sedin and Joe Thornton for the most 60-plus assist seasons in that span of time (five apiece). This season, Backstrom was second in multi-assist games (15) to Connor McDavid (19), giving him 125 multi-assist games in his career, tied for second (with Sidney Crosby), behind only Henrik Sedin (132) over the last ten seasons. In the 15 games this season in which Backstrom recorded two or more assists, the Caps were 14-0-1. Cheerless’ Take… Time on ice looked weird for Backstrom this season. He skated just 12 games with 20 or more minutes of ice time this season, and the Caps were 4-5-3 in those games. They were 5-1-0 when he skated less than 16 minutes. Not to say less of Backstrom is more (that might reflect the Caps not needing him out there to make up deficits), but it just looks strange. Here is another one, though. Losing faceoffs seemed to matter, if only as a coincidence, but not in the way one might have thought. The Caps were 28-6-4 in games in which he was under 50 percent on draws, 27-13-4 in games where he was 50 percent or better. Odd Backstrom Fact… With ten games of three or more points this season, Nicklas Backstrom became the second Capital in franchise history to record at least ten three-point games in a single season more than once. He had 13 such games in the 2009-2010 season. Alex Ovechkin leads the franchise with three such seasons. Dale Hunter (12 in 1991-1992), Michal Pivonka (10 in 1991-1992), and Mike Ridley (10 in 1992-1993) are the others (information from hockey-reference.com). In what might have been the team’s most satisfying regular season game of the season, a 7-1 win over the Penguins, Backstrom had what might have been his best game of the campaign. It was certainly his most productive one. Backstrom did not record a point on the Caps’ first goal of their November 16th contest against the Penguins, Jay Beagle assisting on a T.J. Oshie goal 7:32 into the game. But Backstrom was all over the score sheet thereafter. He scored a goal of his own late in the first period, taking a feed from Oshie at the red line, skating into the Pens’ zone and wristing a shot under the left arm of goalie Matt Murray. Then, he recorded an assist on an Oshie power play goal with just 7.9 seconds left in the first period. He added assists on goals by Dmitry Orlov and Justin Williams early in the second and third periods, respectively. And after the Penguins ruined goalie Braden Holtby’s shutout with less than four minutes to go in the contest, Backstrom added his second goal on a play that seemed to distinguish his 2016-2017 season from seasons before it. Taking a long lead pass from Nate Schmidt just outside the Penguin blue line, he skated in with Marcus Johansson on his left. In games and years past, he might have opened up and tried to feather a pass to Johansson for a shot. On this occasion, he called his own number and snapped a shot past the glove of relief netminder Marc-Andre Fleury to cap a 7-1 win. It was the fifth time in his career Backstrom recorded five or more points in a game, moving into second place in franchise history, one behind Peter Bondra. He was one of only five players in the league to score five or more points in a game in the 2016-2017 season. When a player known for his two-way play has a bad game both ways, it’s a game to forget. Such was the case in Brooklyn against the New York Islanders when Backstrom and the Caps seemed to be in an egg nog coma in their first game after Christmas. The Islanders seemed on step ahead of the Caps – literally – throughout. New York scored the first goal of the game eight minutes in, only to have the Caps tie the game five minutes later. It was a pattern repeated once more, and then the Islanders took a lead they would not relinquish early in the third period, Backstrom being on ice for each of the three Islander goals. He was not on the ice for what would be the game-winning goal, an Anders Lee breakaway of a Caps turnover. But Backstrom was a minus-3 for the game (one of two such games he had for the season), and he managed only a pair of shot attempts. In more than five minutes of power play ice time he did not manage to quarterback the Caps to a goal, and Washington dropped a 4-3 decision. 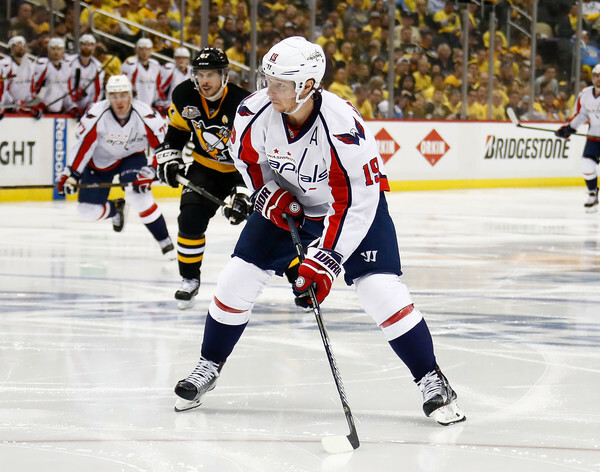 It is hard what to make of Nicklas Backstrom’s postseason. As of May 20th, he remained one of just seven players appearing in at least ten postseason games who averaged at least one point per game. His possession numbers, like those of the team in general, were solid, both individually (55.15 CF% at 5-on-5) and in combination (with Ovechkin and Oshie, a 56.73 CF% at 5-on-5; numbers from Corsica.hockey). He led the team in goal scoring (six) and points overall (13). He was remarkably efficient as a shooter, converting six of the 26 shots he took in 13 games (23.1 percent), third among the 85 players in the postseason to date having recorded at least 20 shots on goal. On the other hand, he went without a point in three of the seven games in the second round loss to the Penguins, all three of those games ending in losses, including the series-deciding Game 7. It was part of a disturbing pattern with Backstrom. 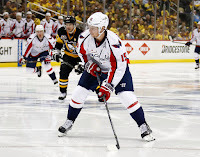 In 20 games facing elimination in his career, Backstrom is 4-11-15, plus-11. That’s not bad. But in 10 Games 7 in his career he is 1-2-3, plus-2. The Caps are 3-7 in those ten games. For Backstrom, the postseason was very much an uneven affair, and it gives greater weight to his overall grade than it might have in previous seasons (as will be true of all of the Capitals when evaluating their respective seasons). It applies once more. It is hard to say of a player who has been as consistent and as consistently productive as Nicklas Backstrom that he has come up short in the biggest games, but it is hard to avoid that conclusion. And the notion of blame not skipping him to the next player seems to have particular relevance and urgency here, given the outsized blame placed on Alex Ovechkin for the Caps’ postseason woes. For both Backstrom and Ovechkin, the clock is ticking louder with respect to time they have left in their careers to shake off the demons that appear in the spring. In Backstrom’s case, doing that is likely going to mean raising his game in a season’s ultimate game to a level he has not been able to find. It is the cloud that hangs over his 2016-2017 season.